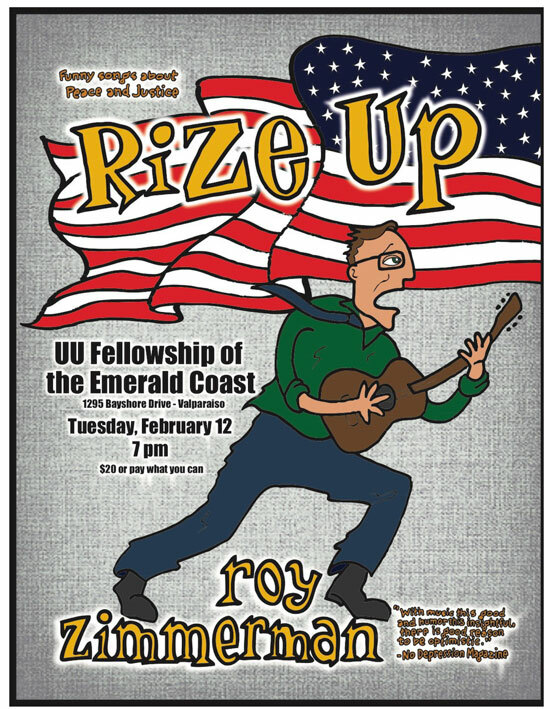 Musician, humorist and all-around entertainer, Roy Zimmerman is making another appearance in our area on Tuesday, February 12 at the Unitarian Universalist Fellowship of the Emerald Coast (UUFEC). Zimmerman presents "funny songs about Peace and Justice," singing his own music, accompanied by his guitar. Songs such as "Creation Science 101" and "Faulty Intelligence" were reviewed by No Depression Magazine, which wrote "with music this good and humor this insightful, there is good reason to be optimistic." The 7:00 p.m.event will be proceeded by Wine and Cheese at 6:00 p.m. A donation of $20 will get you in the door. The UUFEC is located at 1295 Bayshore Drive in Valparaiso, at the corner of John Sims Parkway and Bayshore Drive. While reservations are not required they are appreciated. You can call the church at 850-678-7197 and leave a message. For more information, please go to www.uufec.com. The Unitarian Universalist Fellowship of the Emerald Coast has been in the Florida Panhandle since 1958, offering "a voice of reason" for our community. Services are Sunday at 10:00 a.m.